Mind blown! 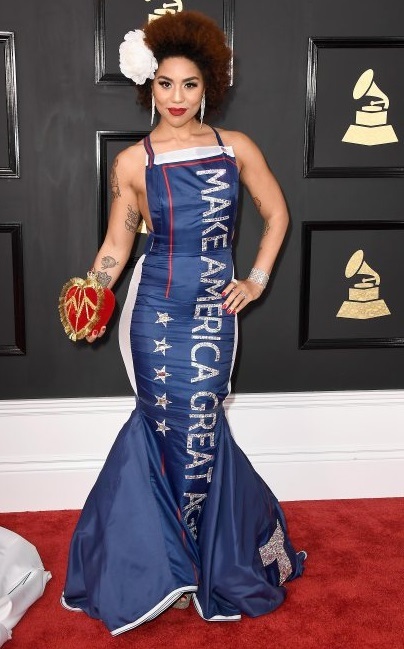 The Grammy’s and most of the entertainment world is anti-Trump or so they say. But not Joy Villa. Let the death threats begin? Or will Villa set a trend that many Conservatives predict will come soon? Trump-Mania! Currently the entertainment world lives on the muscle-memory of showing love only for their former messiah. But while Barack Obama vacations with billionaires, the sand foundation erodes from beneath the feet of Hollyweirdos. Celebrities live charmed lives, but their families don’t. When they are grounded by Mom and Dad, the cousin in prison, and the sister who got knocked up by the ex-brother-in-law, things get real. The performer, who was not nominated at the show and was one of the first guests to arrive, initially walked the red carpet outside of Los Angeles’ Staples Center in a white cape. 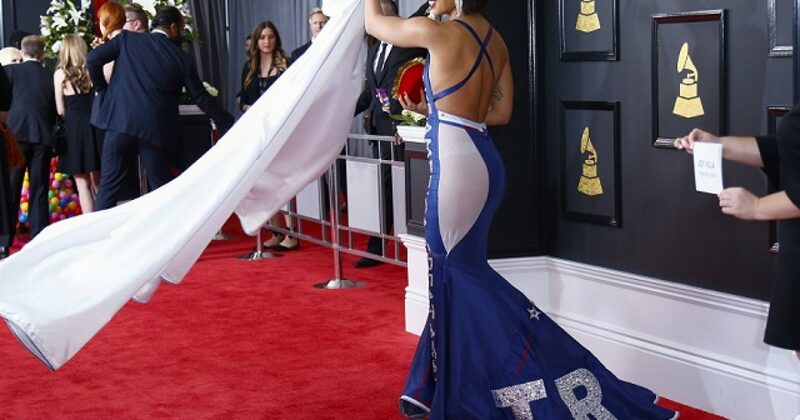 She then did a dramatic costume change, whipping off the draped fabric to reveal a form-fitting red-white-and-blue dress emblazoned with President Donald Trump’s signature slogan. Some say Villa wore the Trump dress for attention. If so, she accomplished what she wanted. She got my attention, and likely the attention of millions of others who didn’t know her.